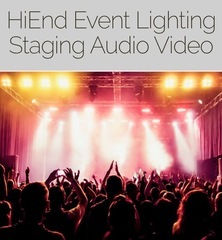 M21928 A MidAtlantic leading lighting/stage/audio/video production company is relocating and will make a substantial liquidation of high equipment. AUCTION CLOSING DATE: Monday, Jan 7th, beginning at 11:07 am. Bidding closes on the first item at 11:07 am, then closes at the rate discussed in these Terms and Conditions of Sale.